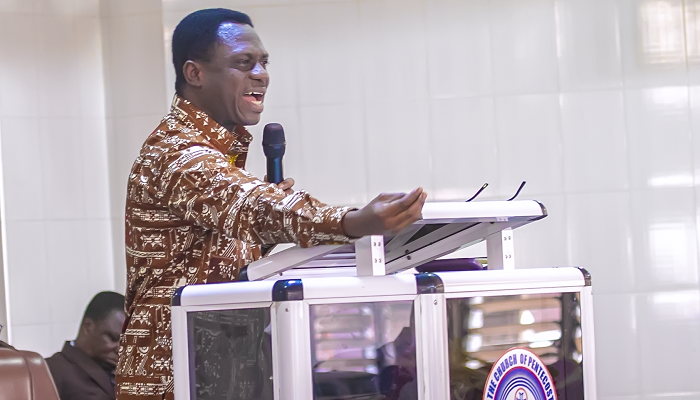 The Chairman of The Church of Pentecost, Apostle Eric Nyamekye, has challenged ministers of the gospel to ensure that the authority conferred on them by the church is exercised judiciously to edify others. According to him, authority must be exercised to solve problems, answer questions and meet the needs of the members of the church. Addressing newly ordained Apostles/Area Heads, Resident Ministers of the Pentecost International Worship Centres (PIWCs), PENSA Travelling Secretaries and all COP Chaplains in the Ghana Armed Forces, Ghana Prisons Service and other institutions, at the Sophia McKeown Temple, La-Accra, on Thursday, September 6, 2018, the Chairman bemoaned that society has become chaotic because many people in authority have failed to deliver on their mandate. Speaking on the topic, “Authority and Power”, he explained that ‘authority’ which is the mandate to perform, and ‘power’ which is the ability to perform and produce effect, are two different words which are used interchangeably. The Chairman indicated that the leadership of the church expects ministers serving at various levels to produce effect, because Jesus Christ has already given them power through the Holy Spirit, coupled with the authority that has been conferred on them by the church. His sermon was based on Luke 9:1-2; 20:20; John 1:12; Acts 1:8; Matthew 21:23-27; Daniel 6:1-6; 2 Corinthians 10:7-10; 2 Chronicles 9:1; Proverbs 24:10; 2 Samuel 18:9 and Job 32:4ff. Focusing on authority, Apostle Nyamekye mentioned that authority must be conferred by someone, ought to be questioned to know its source and must be tested. It is also jurisdictional (has boundaries within which it must be exercised) and must be geared towards edifying others. Chairman Nyamekye entreated the ministers to respect authority and employ the appropriate communication channels to address issues. The annual orientation is organised to equip the ministers and their wives for the task ahead. The two-day event which started on Thursday, will end on Friday, September 7.